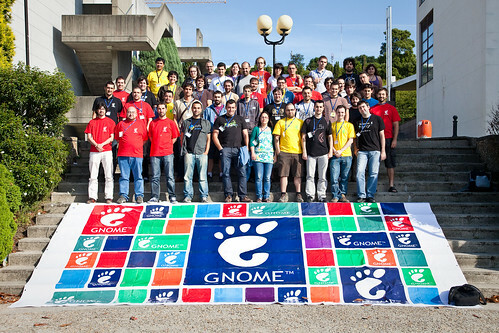 Yesterday was the last day of the 7th edition of GUADEC Hispana, originally to be organized in Chile but due to the disastrous earthquake, it was moved to the city of Corunna, Spain. Between hacking on OCRFeeder (expect a new version soon), giving a talk about it, attending nice presentations and chatting with people, I had a great time. Diego’s presentation about Epiphany was simply epic and Mario gave a very complete crash course of git. I guess there’s a first time for these things but Thursday, while I was giving a demo of the new OCRFeeder’s features, it crashed on me… Never again will I laugh at Mr. Gates and friends when their products freeze out of the blue (nah, it is too funny). Now that I think of it… was this the first time a Portuguese man gave a talk at GUADEC Hispana? View more presentations from Joaquim Rocha. And from next Monday on, I’ll be in Den Haag for GUADEC 2010. My lightening talk about the Predictor Input Method got accepted, so if you’re into this kind of stuff, I hope to see you there.